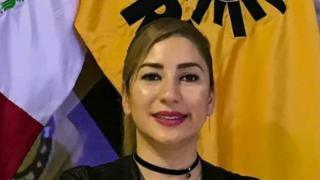 A newly elected Mexican Congresswoman, Norma Azucena Rodríguez Zamora, has been kidnapped at gunpoint on a highway in central Hidalgo state. Two men shot at Ms Rodríguez's car, injuring an assistant and the driver and causing the vehicle to flip over. The gunmen pulled Ms Rodríguez from the car and forced her into their vehicle. The kidnapping comes little more than a month after the mayor of the town of Naupan was seized and killed in the same area. Ms Rodríguez was elected on 1 July to represent eastern Veracruz state in the lower house of Congress for the centre-left Party of the Democratic Revolution (PRD). The 32-year-old was due to take up office on 1 September. The state she will represent is one of the most violent in Mexico. Before running for Congress, Ms Rodríguez served as mayor of the town of Tihuatlán in Veracruz. Her kidnapping happened as she was travelling along a highway in neighbouring Hidalgo, the same on which the mayor of Naupan, Genaro Negrete Urbano, had been kidnapped last month. Mr Negrete's body was found earlier this month. He had been shot dead. The motive for his killing is not known but local politicians often become targets for criminal gangs if they are seen to interfere with the gang's business. The campaign for the 2018 general election saw a spike in violence against political candidates. Members of Ms Rodríguez's party have demanded that she be released safe and sound.